These days, everybody owns a yoga mat or at least knows somebody who does. Yoga has become one of the more popular exercises in an increasingly fitness-obsessed world, praised for the wonders that it does for people’s flexibility, mobility, and strength. But did you know that it can also help you sleep? If you know yoga as the program that leaves you contorted into knots, that might sound strange. But yoga is first and foremost a method for enhancing your well-being, and that doesn’t just mean your physical abilities. There’s a strong and long-running meditation tradition at the heart of yoga, and if you look past the stretches and postures, you’ll find that a lot of yoga is focused on establishing a healthy equilibrium in both body and mind. Eager to go beyond the usual yoga exercises? We’ve rounded up our favorite resources on yoga meditation to help you get started. This is the online home of the Art of Living Foundation, a nonprofit headed by the teacher Sri Sri Ravi Shankar. Consider this your comprehensive resource for all things yoga and meditation: you’ll find structured courses, links to scientific research about meditation and yoga, talks and commentaries from Shankar and other experts, and more. 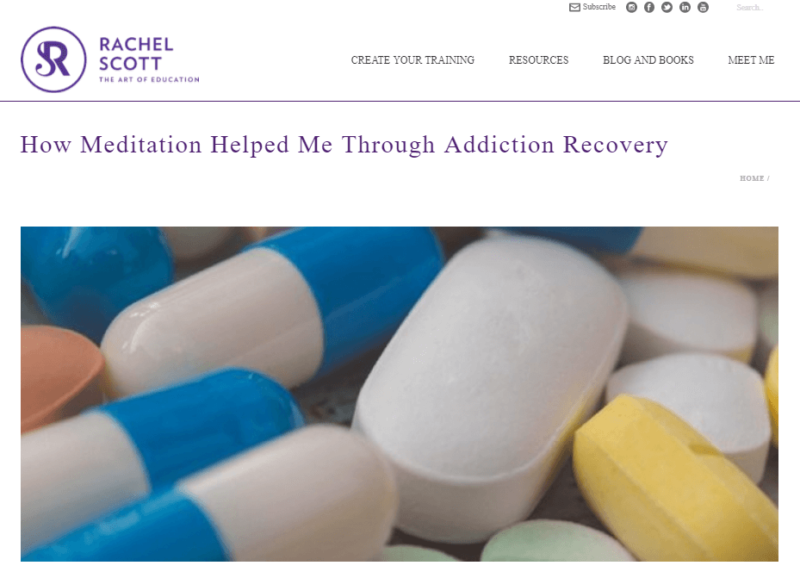 The blog itself is a steady feed of reflection prompts, meditation tips, and suggestions for advanced techniques that can help shape your meditation practice to address any specific challenges or goals you might choose. Even non-Aussies can get a lot from this website, from accessible introductions to yoga, meditation, and related lifestyle changes/routines, to supplemental resources like ambient music and guided meditation videos. The site’s main blog is designed to inspire and enrich your daily practice, with reflection prompts, suggestions for new yoga poses to try, and even recipes to help you bring a similar healthful approach to other parts of your routine. If you do happen to live in Australia, you’ll also find schedules and registration pages for the school’s courses, which cover different levels of yoga asana, meditation, and even kirtan (yogic music) practices. As the site’s tagline claims, this is the most comprehensive portal of free yoga and meditation courses — and a quick browse will prove the truth of that statement. You’ll find tons of guided meditations, yoga breathing exercises, free classes, and articles offering tips and suggestions for starting — or expanding — your practice. Anmol Mehta’s extensive catalog is the best and worst thing about it: there’s a variety of material from numerous sources, but it can be a bit difficult sifting through it all to find the ones that best suit your needs. Still, if you’re game to roll up your sleeves and dig a little, there’s a lot of great meditation material here just waiting to be found. If you’re starting to feel aimless, or you’re casting around for something more substantial to build your practice around, give Audio Dharma’s library a listen. 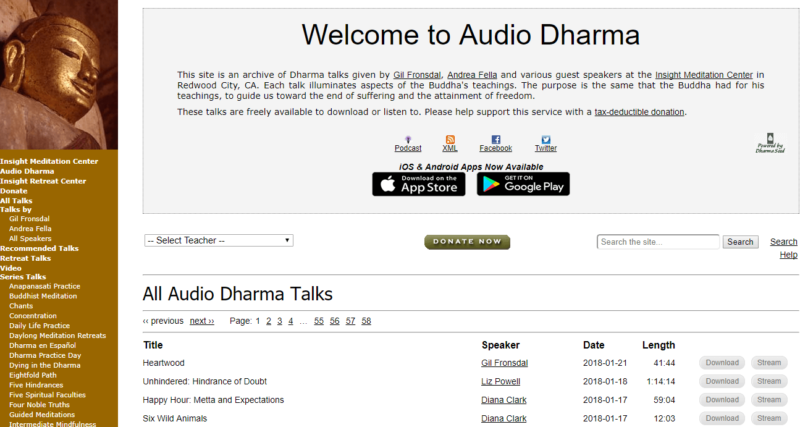 Audio Dharma is an extensive library of talks from expert speakers recorded by the Insight Meditation Center in California. All of the files are free to download or stream, and there’s a handy list of categories and themes in the sidebar so you can jump straight to your topics of interest. From practical guides like using meditation to manage pain to more contemplative discussions of the philosophical and spiritual principles underlying most meditation traditions, you’ll never run out of fantastic material for enriching your knowledge and practice. Most episodes last for around 40-60 minutes, but you’ll also find quick tips and meditation practice notes lasting anywhere from 4-15 minutes. Most of the Chopra Center site is built to promote the center’s courses and events, but there’s a good collection of free digital resources to check out, too. 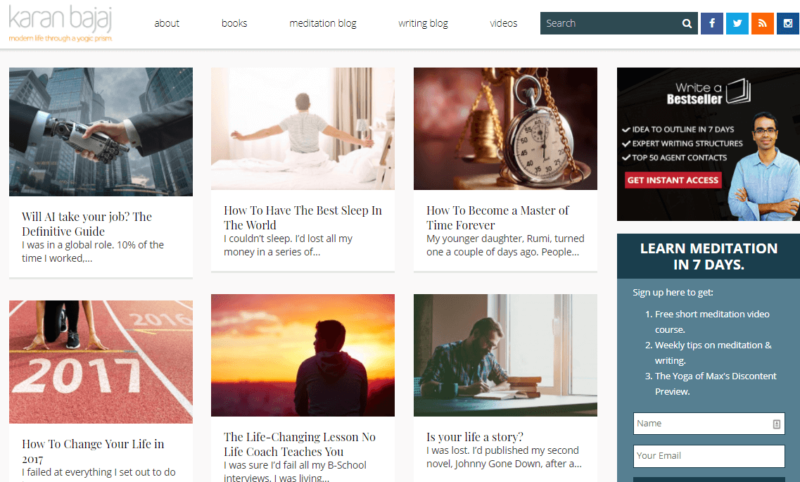 The site blog collects articles that range in scope from quick inspirational quotes to practical guides for changing up your lifestyle to cultivate peace of mind. The site branches out from meditation to incorporate related approaches like exercises, diets, and so on. 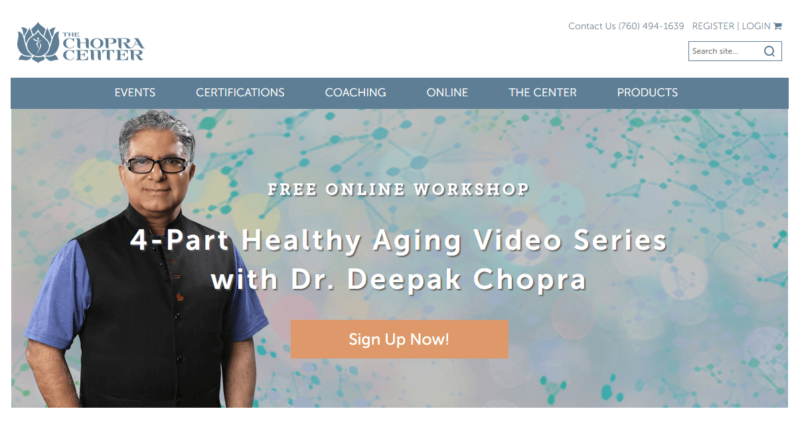 The Center’s headed by Deepak Chopra of Oprah fame, so bear in mind that most of the material is in the vein of typical self-help and personal improvement resources. If you’re not familiar with the classic yoga pose, this blog’s name might be a bit strange to you. Just know that the title captures the best thing about this site: a casual, playful approach to yoga and meditation that feels like reading posts from a good friend. Most of the site is dedicated to yoga classes, workshops, retreats, and instructor training events, so if you’re the type who thrives in a group setting, this might be the best place to start your practice. 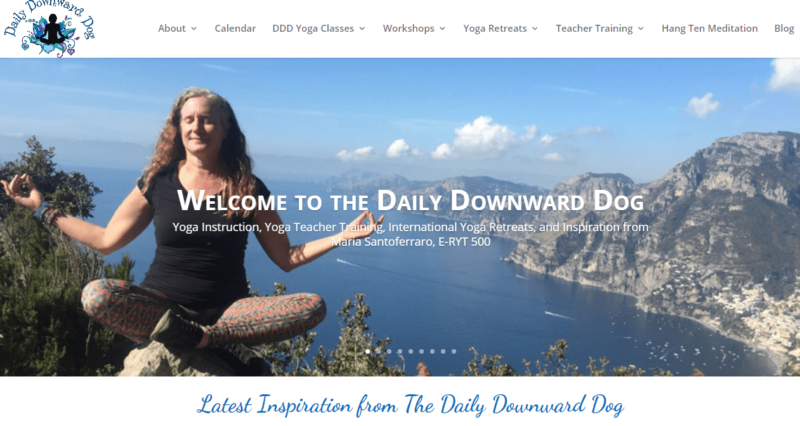 Whether or not you’re ready to jet off to a yoga retreat, though, the blog itself is a great read, filled with inspiring reflections, lessons, and prompts written in the distinct voice of yoga teacher Maria Santoferraro, who runs the site. Davidji is a blog run by the meditation teacher, author, and stress-management expert of the same name. Like Daily Downward Dog, it’s full of posts written with a casual, accessible air. If you’ve always wondered whether “normal people” can sustain a yoga and meditation practice, this is the blog that answers you with a firm, serene YES. 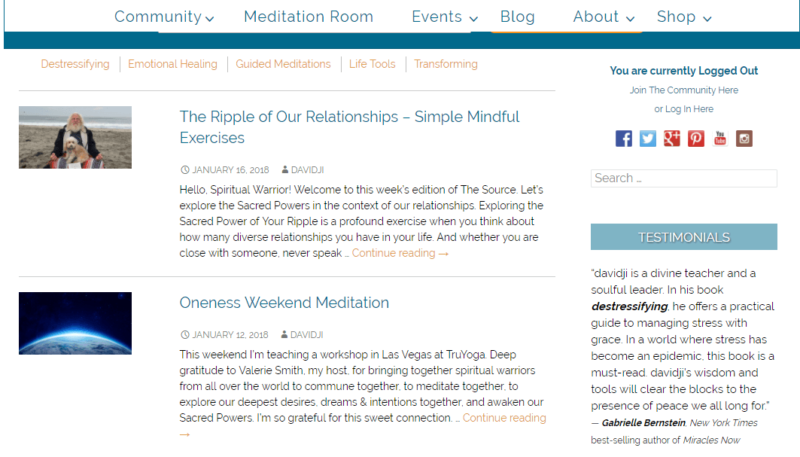 Davidji updates frequently with meditation guides, reflections, and links to useful tools like videos and music tracks. Most of the focus here is on using meditation to manage stress and problems, so if you’re always tossing and turning because of the worries whirling in your head, Davidji might be a good fit for you. Here’s another personal blog, this time run by Mumbai-based novelist and yogi Karan Bajaj. Every week, you’ll find new posts about yoga, meditation, and how you can use both to improve various aspects of your life. In fact, one of Bajaj’s recent posts talks about improving the quality of your sleep! We like Bajaj’s blog because he always discusses his chosen topics through the lens of his personal experiences, so every post is a glimpse into yoga meditation’s real-life effects. Bajaj also offers a weekly newsletter filled with meditation tips and inspiration, so if you find yourself short on time, you can sign up to get his insights delivered straight to your inbox instead. Rachel Scott is a yogi and yoga education consultant, and her blog covers a variety of topics related to yoga, meditation, and wellness. Compared to Davidji and Karan Bajaj, Scott focuses more on the nitty-gritty of yoga and meditation: you’ll find reviews of related products like yoga mats and resource books, tips for addressing problems like insomnia with yoga, and interviews with experts and longtime practitioners. There’s not as much focus on meditation, but Scott’s posts provide great advice for building a lifestyle and routine that will help you make the most of your meditation practice. Yoga Yak isn’t the prettiest site on the web, but what it lacks in visual panache, it makes up for in the quality of the resources it offers. 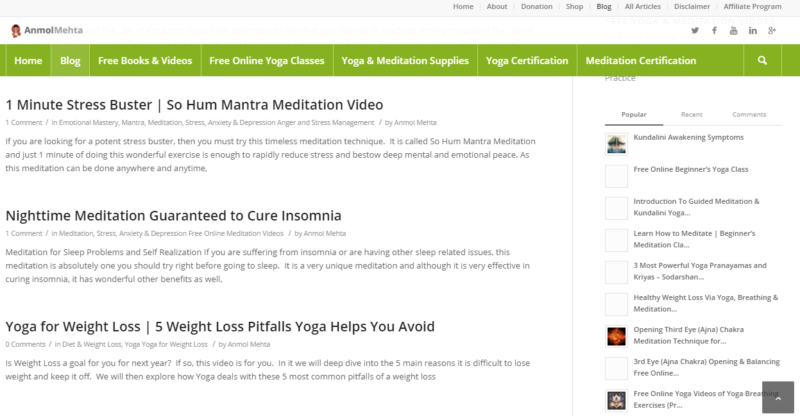 The site has dedicated sections to pranayama (yogic breathing) exercises, meditation guides, and even yoga-based relaxation techniques. Most of the material comes in the form of video guides, so this is the perfect resource if you’re more of a visual learner. You’ll find guides addressing specific problems like back pain, troubled sleep, and more, plus supplemental material like ambient music and nature sounds for use on your next meditation session. Think yoga is all about solemn chants and intense poses? Think again. If you’re struggling to find the joy and lightness in your yoga meditation practice, YogaDork should be your first stop. 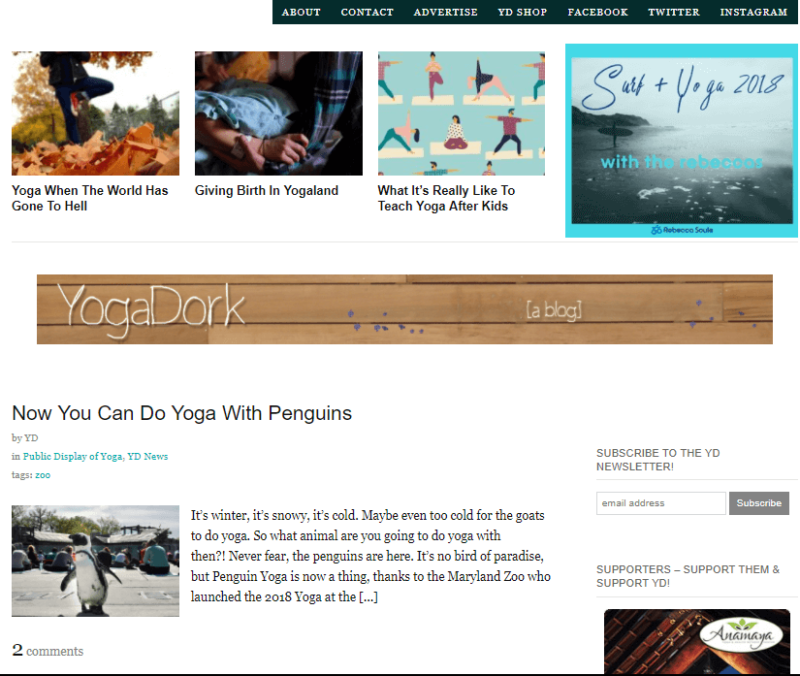 This site delivers yoga news and discussions with a breezy sense of humor. Witty editorials will have you looking at your practice in a new light, while short, informative articles impart tips and suggestions for making your practice fun again. Whether you’re a beginner or a seasoned practitioner, YogaDork can help inject more excitement and lightheartedness into your meditation sessions. If you want to go all-in on yoga meditation and plan to overhaul your lifestyle to match, then you should definitely check out Yogi Approved. You’ll find lots of resources on meditation, but this site goes beyond that to tackle other aspects of serious yoga practitioner life, from vegetarian recipes to free classes to new poses that you can incorporate into your routine. If you’re still skeptical about how big an impact yoga can have on your life, Yogi Approved is the site that could change your mind. 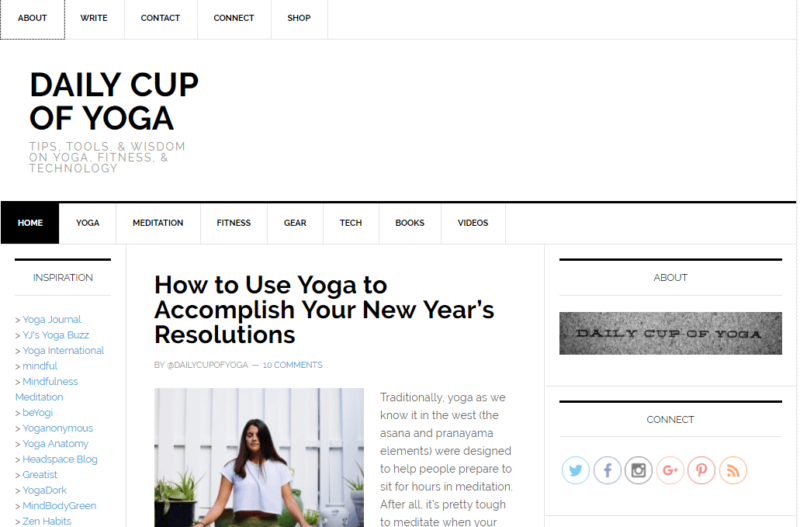 If you’re wondering how yoga meditation can fit into the hectic pace of today’s wired world, then check out Daily Cup of Yoga. This blog is dedicated specifically to exploring the intersections of yoga, tech, and daily life, and it delivers a steady stream of insightful posts that will give you new ideas about how yoga meditation can improve your life. Daily Cup of Yoga also features regular guest posts from a variety of contributors, so you can look forward to reading different perspectives on yoga and meditation. There are different types of yoga and different ways to practice meditation, and Yoga Journal tries to be your trusty companion whichever ones you pick. 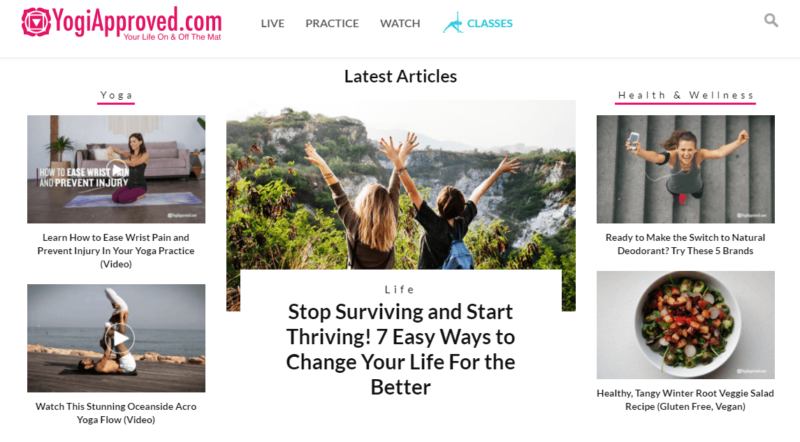 Not only does Yoga Journal feature numerous contributors posting about their personal experiences with yoga and meditation, you’ll also find articles, videos, and guides from certified teachers and experts. There’s something here for you, whatever your chosen method, technique, or style, and you’ll always get the material in a sleek, user-friendly package to boot. Yoga Journal is also included in our Top Meditation Blogs.